I thought that you’d all like to know, pretty randomly, that I scored 55 (above average for the United States) on National Geographic’s Greendex test. I’m pretty proud of it, because being ‘green’ is trendy nowadays. I mean, everybody wants to be green, right? Anyway, I thought that it was pretty interesting, and I wanted to show off my lovely score. The average for the US (the lowest in the world, not surprisingly) is a lovely 44.9, while the average in India and Brazil, the two countries tied for first place, is 60. Anyway, National Geographic has provided this test for everyone, so that you can find out where you fit in. 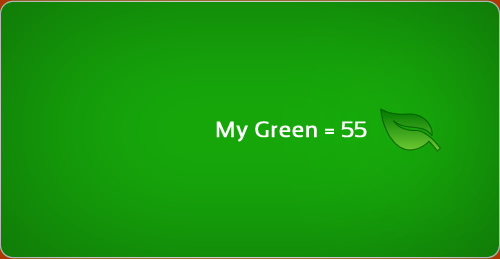 Plus, it gives you an idea of some basic actions that you can take to be ‘green,’ should you feel so inclined. Perhaps we should suggest that to them.